The GNOME Q2 Quarterly Report is available. The second quarter of 2010 was a big one for the GNOME Foundation. We elected our new GNOME Board of Directors, raised enough money to hire a system administrator and held numerous successful events while planning for GUADEC, our annual get together! In the report you can read updates from many of the GNOME teams from the release team to documentation to the Outreach Program for Women to … please take a minute to catch up on all the hard work these teams have been doing for GNOME. Thanks to every one who helped put together the report. During the first week of August, I went on vacation. Since then I’ve been trying to catch up on my Inbox, follow up on conversations, and generally make sure that I’m helping make great things happen in GNOME. 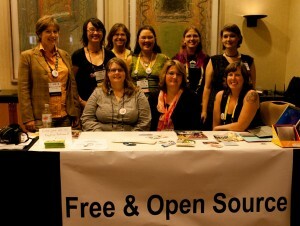 Attended LinuxCon in Boston and made a call for free (as in free software) web services. Pointed out several of the ones GNOME is working on. Ran into lots of interesting people but not enough time to talk to them all as much I’d have liked. I met one on one with Rosanna. And Brian. I attended board meetings. I think the new board is still figuring out who’s doing what and who’s good at what but they are coming together and their talents balance nicely. Met with Nokia about the money they are providing to GNOME Mobile. Tried to attend a webinar about Finances and nonprofits put on by our insurance company but had some technical difficulties. Will try again next time. Had brief meetings with our attorneys and our accountant to get some clarifying information. Worked on the Free Software booth for Grace Hopper. Booked hotel for that. Booked travel for Ohio LinuxFest. Worked on getting GNOME representation at board and community level for the Desktop Summit 2011. Finished the Q2 quarterly report with help from all the teams, Vinicius Depizzol and Vincent Untz! Debating future travel. Latinoware, GNOME Forum Brazil, Desktop Summit 2011 planning meeting (how much of a role should I play in GUADEC – is it changing? ), Boston Summit, … already going to Ohio LinuxFest and Grace Hopper and I’m enjoying being home for a while. Had a meeting with LiMo, Samsung, Ryan Lortie, Alberto Ruiz and Vincent Untz at GUADEC. To talk about GTK+ and upcoming related events. Reviewed actual budget numbers for the year in preparation for helping with our 2011 budget. The year starts in October so now is the time to get in your requests for community events or other things you think GNOME should do in the next year. Connected several people with great ideas with people I thought could help move them forward. Pinged the MIT folks a few times, as did J5, and we now have rooms for the Boston Summit! Following up with marketing team and others on numerous offers to give us pro-bono ads in magazines. Met with a couple of advisory board members. Hoping to meet up with those I missed via phone soon. Attended the fantastic GNOME Marketing Hackfest. Got there and back – on the way home we took a six hour detour – making it a more than 24 hour trip home – and flew by the volcano. For something that has caused so much trouble, it’s not very impressive from an airplane. Put together a survey after the hackfest for attendees in order to help the GNOME Foundation and travel committee to make more informed decisions. Attended board meetings. Met regularly with Rosanna. Met regularly with Brian. Encouraged people to apply for the GNOME Board of Directors. Thanks to everyone who applied. Although it’s a lot of work, it’s an interesting and rewarding job! Had GNOME Advisory Board meeting on finances. Helped German update the budget. Discussed 2H (second half) budget plan. Talked to Marina about launching the Outreach Program for Women in the southern hemisphere. Worked with Orbitz to see if they have an account or processes that could help the GNOME Travel Committee. Continued to ping GUADEC sponsors and work out details. Almost all finalized. Kept up on a few GUADEC details and issues, including sponsored travel plans. Met with Jonathan Markow from Jasig and discussed how we do things and if there were opportunities to work together. Jasig makes open source software projects for higher education. Booked travel for most of my trips this summer. Still missing a few that will be paid for by the events. Bummed that tickets to Europe are so expensive this summer as it will make it much harder for us adn companies to sponsor all the folks we’d like to see at GUADEC. Submitted title and abstract for LinuxCon keynote. Attended a couple of the GNOME.Asia planning meetings. It’s coming along nicely this year. You should plan on attending. Met with James Vasile, our attorney from the SFLC, to talk about a few things. Met with a few advisory board members to discuss projects, GUADEC, issues, etc. Met with a potential sponsor. Pushed for a GNOME technologies roadmap process. Put together the list of 2009 donors for the Friends of GNOME page! Due to a Paypal “feature” this was a very manual process. Thanks to Vincent Untz for posting them. If your name should be there and it’s missing, let me know. Thanks to all our Friends both known and anonymous! 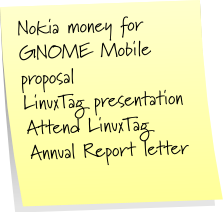 Kept the conversation moving about how best to use the Nokia money to sponsor GNOME apps on Maemo/MeeGo. Worked with Brian Cameron and the sys admin team to launch the GNOME Developing World mailing list. If you are interested in how we can promote GNOME, the free desktop, in the developing world, please join the list. Talked to AEGIS and the GNOME Accessibility team about having a GNOME A11y Hackfest atAEGIS conference. Changed Amazon Affiliate accounts to pay out less often as the international checks cost quite a bit of money to deposit. Worked at finding people to represent GNOME at events. It was more difficult than I expected and after several conversations (including some at the marketing hackfest) we will be launching a GNOME Ambassadors program to try to improve this process and get better GNOME representation. May 31st is a US holiday.